When FDA official Robert Temple, M.D., speaks at the agency’s opento- the-public workshops and other meetings, Gary Buehler, VP of global regulatory intelligence and policy at Teva Pharmaceuticals, listens. “Remember the old TV commercial about the stock brokerage company, ‘When E. F. Hutton talks, people listen?’” Buehler asks. Dr. Temple, deputy center director for clinical science at CDER (Center for Drug Evaluation and Research), is an FDA “thought leader,” to whom regulatory intelligence officials should listen during public meetings, Buehler said. “Dr. Temple’s comments often provide insight about how FDA officials are thinking, what they are planning to do, and what is on the horizon regarding new policies, regulations, and guidelines,” he said. “I take that information and assess how it applies to Teva,” added Buehler, who formerly headed the FDA’s office of generic drugs. He joined the company in 2010 after 24 years at the agency. 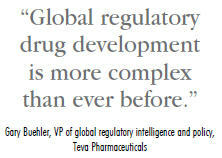 Regulatory intelligence (RI), which made its first appearance about 15 years ago at the large biopharmaceutical companies, is a relatively new arm of global regulatory affairs (RA) at Teva, Buehler said. RI typically is part of a biopharmaceutical company’s RA department and broadens the traditional regulatory affairs function beyond preparing and submitting applications to the FDA and the regulatory agencies of Europe and Asia. RI officials keep the company’s leadership up-to-date about current regulations affecting the development, approval, and maintenance of products, as well any changes to the regulations and/or regulatory landscape that may impact their efforts. “RI focuses on the regulatory pathways associated with the drug development and approval process, often using historic decisions of regulatory agencies as a lens for potential future decisions,” he said. According to Buehler, RI contributes to every biopharmaceutical company’s bottom line by helping the RA teams provide the highest quality submissions to agencies. If the FDA or EMEA (European Medicines Agency) delays approval of a regulatory submission because of a flaw in the application, the long-term sales of the new compound could be significantly affected, particularly if the company aims to be firstto- market in a specific drug class. “Global regulatory drug development is more complex than ever before,” because of the globalization of the life sciences industry, Buehler noted. “Today’s regulatory professionals must understand not only the regulatory guidances for each geographical market in the world, but also the hot button issues that affect the review of new drug applications in these regions. That’s because those issues also may influence the FDA’s evaluation of the compounds,” he said. 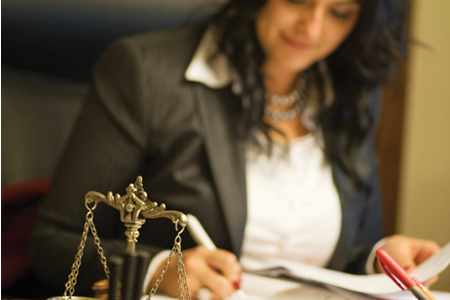 Today’s RI professionals also must shape the global regulatory landscape. “By proactively participating in the drafting of legislation and guidance documents and providing input to questions regulatory agencies have in formulating their perspectives we are ultimately helping the regulatory agencies have the information they need to review and approve medicines,” he said. By submitting comments about the FDA’s draft proposals, the company’s RI staff can influence whether the proposed regulation or guidance will be adopted entirely, in part, or at all. If a company plans to submit an application to the FDA for marketing approval of a biosimilar, the RI staff members’ job would be to provide the agency with detailed information about the safety and efficacy of the biosimilar products that have been on the market in Europe. “The FDA loves data,” Buehler noted. The EMEA, which has given marketing approval for biosimilar products since 2006, is now the largest biosimilar market worldwide. RI is typically separate from but collaborative with the competitive intelligence (CI) function at biopharmaceutical companies. “CI focuses more on the financial side of the business, looking at market shares, sales, and pricing,” he said. There are points of overlap, for example in claims and promotion, in which RI and CI should work together to provide a comprehensive picture to guide the company. To guide the regulatory decisions of the company’s leaders, RI staff must develop systematic procedures to review, document, and summarize massive amounts of data. “The leaders of all affected functions at the company should be trained or informed in a timely manner,” Buehler said. Biopharmaceutical companies often turn to specialized external consultants to supplement the work of RI staff. But, even if consultants are hired, RI leaders should continue to keep abreast of regulatory agencies by, for example, attending open-to-the-public FDA sessions. Attending these meetings and paying attention to thought leaders such as Dr. Temple are among the best of the “best practices” to impact the company’s bottom line.